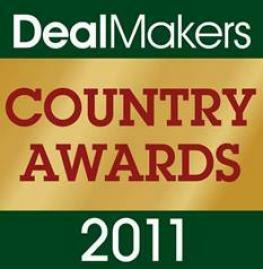 We are pleased to confirm that your firm has been acknowledged and voted as a winner in the DealMakers Country Awards 2011 campaign. You may recall the resounding success of the DealMakers Global Awards 2011 campaign earlier this year. The DealMakers Country Awards 2011 campaign provides our global readership with a comprehensive guide to those firms that are noted for demonstrating a consistently high level of ability, within those Countries that the monthly publication reaches, whilst ensuring they are kept well informed as to who the firms of note are, thus ensuring those Award winning firms receive appropriate recognition and acknowledgement. Recognizing the experience and skills that many of the developed nations have, we know how important it is to be recognized as a leader in your field of expertise. The DealMakers Country Awards 2011 recognize a select number of leading professional firms, across the globe, for their individual areas of specialization, within their geographical location. 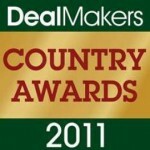 The DealMakers Country Awards 2011 are presented across all geographical locations that the Monthly Magazine penetrates. We recognize and salute the organizations & advisers that have performed to exceptional levels during the most difficult period that the global economy has experienced for decades. 81,500 electronic voting forms were issued. By close of business Friday 20th May 2011, votes received totaled 17,115, demonstrating a 21% response rate. The poll represents who the readership believes are the leading professional firms, within the various areas of specialization, across the various geographical regions.